Colorful Visions Art Glass Studio - Family owned Long Island art glass studio specializing in custom stained glass and kiln/fused glass designs. Our studio is open to the public Tuesdays - Saturdays. We are located on Long Island, in Bayport, and welcome visits and inquiries. Custom stained glass is our specialty. Please browse our categories below... and there's lots more where they came from! 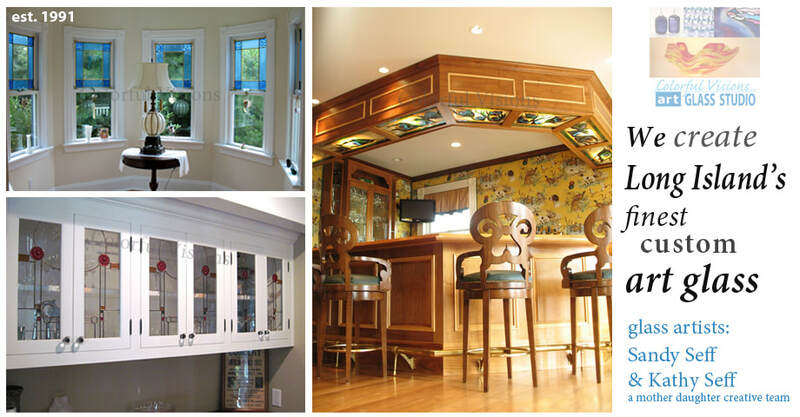 We specialize in designing and creating custom stained glass. From concept to fabrication-we gladly work with home owners, contractors and builders, interior designers and architects to make a work in glass that is completely customized to the clients' vision. The front of our working studio in Bayport, is an open and colorful gift gallery. Shop for home decor, unique gifts or add art glass to your art collection.